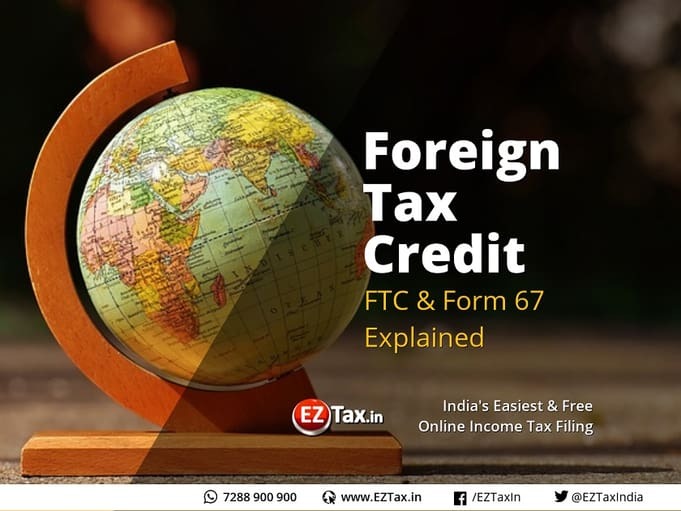 Getting Foreign Tax Credit & How to submit Form 67 Online? The effect of taxation is one of the important considerations for any trade and investment decision in other countries. One of the most significant results of globalization is the visible impact of one country’s domestic tax policies in the economy of another country. This has led to the need for continuously assessing the tax regimes of various countries and bringing about necessary reforms. Residence Rule: This rule holds that the power to tax should rest with the country of residence. There will be double taxation if the both rules apply simultaneously to an assessee. Double taxation means taxing the same income twice in the hands of assessee. In order to take care of these situations, the Income Tax Act, 1961 has provided for double taxation relief. The resident assessee shall be allowed a credit for the amount of any foreign tax paid by him in a country or specified territory outside India by way of deduction or otherwise, in the year in which the income corresponding to such tax has been offered to tax in India. Form 67 is a statement or form required to be submitted by the tax payer to claim foreign tax credit. All assessee’s who wants to take the credit of foreign tax paid in other country are required to prepare and submit form 67 online along with income tax return. Form 67 shall be available to all the assessee’s login. The assessee is required to login to the income tax e filing portal using their valid credentials. The tax payers need to login to the portal and go to e file > Income Tax Forms. The tax payers need to enter the required details and submit the form with EVC or Digital Signature. Submission of form 67shall precede filing Income Tax Return.